Tiny Prints Holiday Cards + Giveaway! This Saturday we are talking our annual holiday family pictures, the photographer and location have been selected, wardrobes have been purchased, holiday cards....not so much! 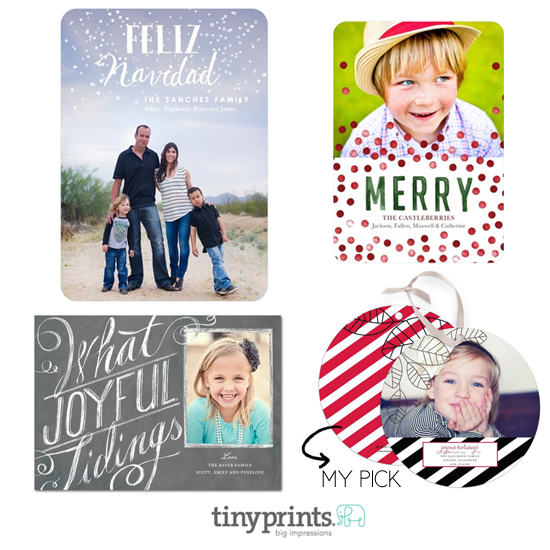 I visited Tiny Prints, one of my favorite sites for holiday cards and found several options I absolutely loved! I think this year, I'm going to do something different and go with a round card that also doubles as an ornament - it comes with double-faced satin ribbons for hanging - I love this idea. 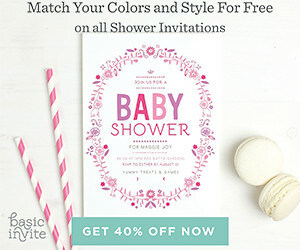 Tiny Prints offers a wide selection of cards, stationary, photo books and gift with unique designs and always offer unbeatable prices. Make sure you visit their special offers page for even more savings! For the latest promos, offers, products, news and ideas, make sure you follow Tiny Prints on Facebook, Twitter & Pinterest. GIVEAWAY Visit Tiny Prints and leave a comment letting me know which card is your favorite and you'll be entered for a chance to win $50 off your total Tiny Prints order- valid until 12.14.2012 (does not include shipping & cannot be combined with any other promos). HOW TO ENTER Simply follow the instructions below to enter this giveaway using Rafflecopter - it's easy! You can enter daily by tweeting about the giveaway plus the more steps you complete, the more chances you have to win! *The first option is mandatory, no other entries will count unless the first entry is completed. Good luck! Giveaway ends on November, 13th at 12:01am. Disclosure: This is a sponsored post. I only recommend products or services I personally believe will be good for my readers. I am disclosing this in accordance with the Federal Trade Commission’s 16 CFR, Part 255. I am obsessed with the Swirls and Stripes pattern! I love the merriest stripes! I can't decide...I like Sweetful Christmas and Holiday Funfetti and so many more! I love the handwritten love card! I love the Happily Wrapped ornament card! Holiday Funfetti! But I seriously love so many it's hard to choose just one! I like the sweetful christmas card. The Holiday Funfetti Christmas cards! I could get them all! I can't choose a favorite! I love the wishing whimsy card!! I would get A Merry Spot! My favorite is the Classy Crystals design. We are going to take pictures this weekend. Borrowing my neighbors nice camera and going to attempt this background. I love "A Merry Spot". Thanks for hosting! I love the merry spots, but I'm a sucker for polka dots! I would get a bold and modern holiday card, so I can send it out to my friends/family of our new address! Snowy Air or Shiny are super cute! I would like the Scripted Stripes. I would order Shadowed Snowflakes! I like the ornament holiday card, the same pick as you. My favorite is Pop of Frost.